There is currently an increase in the number of children in the US diagnosed with acute flaccid myelitis (AFM). This condition involves weakness of the arms and legs and may include other symptoms such as inability to breathe. The CDC has a complete definition of AFM at their website. Cases of AFM in the US and Europe began to increase in 2014. The reason for this increase is not known. It has been suggested that enterovirus D-68 was responsible for the increased AFM observed in 2014 and 2016. This conclusion is based upon detection of EV-D68 genetic material (RNA) in the respiratory tract of children with AFM. 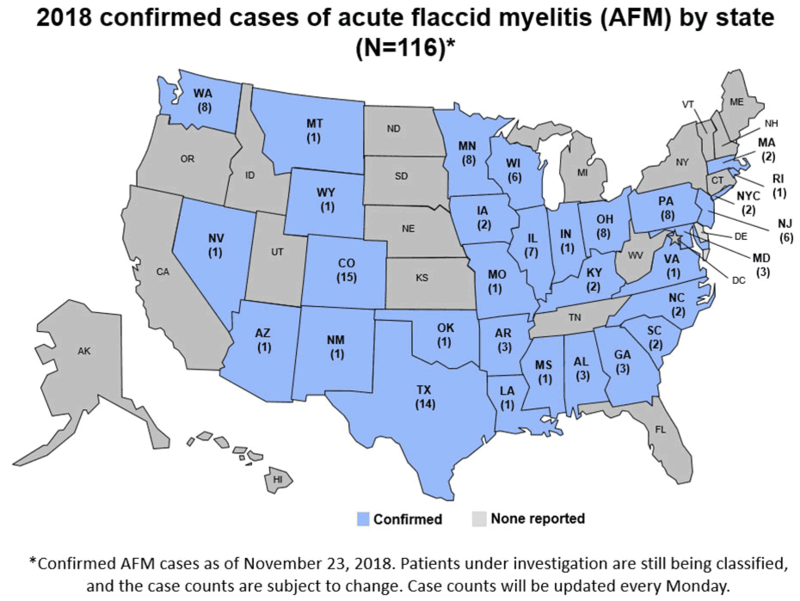 So far in 2018 there have been 72 confirmed cases of AFM in the US out of 191 suspected in 24 states. CDC indicates that the cause of most of these cases is unknown. Certain state health departments, such as New York and Colorado, are reporting detection of EV-D68 RNA from the respiratory tract of some children with AFM. A second enterovirus, EV-A71, has been isolated from some of the AFM children in Colorado. This virus is different from EV-D68 and infects the intestine rather than the respiratory tract. EV-A71 causes a rash called hand, foot, and mouth disease. It is known to be shed in feces, is present in the blood (viremia) and may cause neurological disease. In contrast, EV-D68 is not found in the blood or feces. EV-D68 is very unstable in the acidic environment of the stomach and should not be found in the feces. EV-A71, like poliovirus, is stable in the stomach and can be passed in the feces where it is spread to others. Currently news sources are reporting that some doctors claim that EV-D68 is causing the outbreak of AFM in the US. Some doctors are testing for the presence of the virus in the feces, which is incorrect because, as stated above, the virus cannot pass through the stomach without being destroyed. EV-D68 is unusual in its apparent ability to move from the respiratory tract to the nervous system. Our laboratory is interested in understanding this mode of virus spread. One way that we are studying the virus is by using three-dimensional lung and brain cultures produced from induced stem cells. 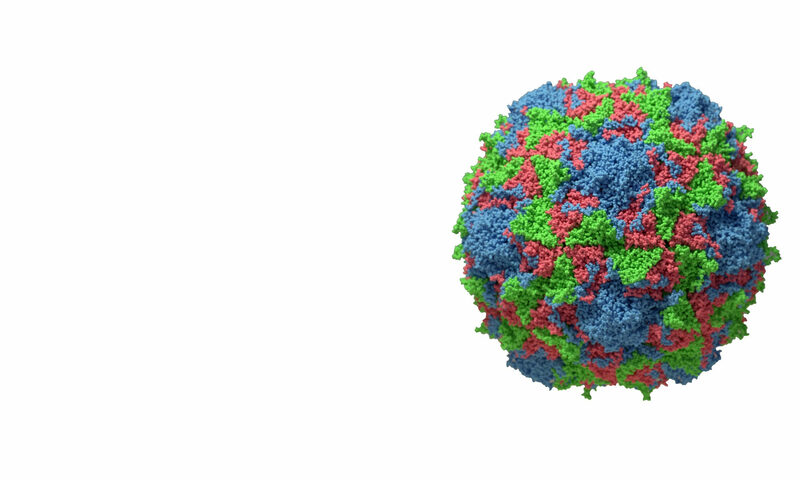 Enterovirus D68 (EV-D68) was first isolated from children with pneumonia in 1962, but an association with AFM/AFP was not observed until the 2014 outbreak. To determine if neurotropism – the ability to infect nerve cells – of EV-D68 is shared among virus isolates, we collected isolates from 1962 through 2014. 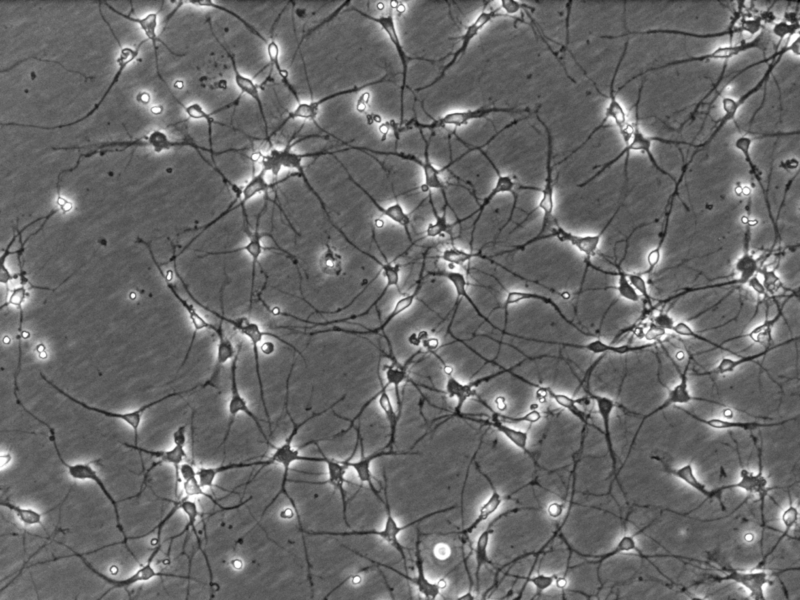 We then used these viruses to infect cultures of human motor neurons (pictured) and human astrocytes. 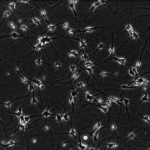 Six of the seven EV-D68 isolates examined replicated in human neurons, and all replicated in human astrocytes. These observations demonstrate that EV-D68 is neurotropic independent of its genetic lineage, can infect both neurons and astrocytes, and that neurotropism is not a recently acquired characteristic as has been suggested. These results have been submitted for publication; a preprint can be found at bioRxiv.